New Delhi: The woes of Punjab National Bank (PNB) are not over. The scam-hit bank on Friday reported its third consecutive quarterly loss at ₹ 4,532 crore for the three months ended September because of a substantial increase in provisions for bad debts. The lender posted a loss of ₹ 940 crore in the previous quarter and a profit of ₹ 560 crore in the year-ago period. The bank discovered a ₹ 14,356 crore fraud at one of its branches in January and has since been struggling to shake off this legacy. The loss surpassed analysts. A Bloomberg estimate by 13 brokers had projected a net loss of ₹ 1,349.2 crore. The bank reported a sharp increase in provisioning. Total provisioning increased to ₹ 9,757 crore from ₹ 2,440 crore in the year-ago period. Of this, provisioning for non-performing assets (NPA) rose to ₹ 7,733 crore from ₹ 2,964 crore in the year-ago period. The bank’s gross NPAs came in at 17.16% as of end-September, as against 13.31% in the year-ago period. However, when compared to 18.26% in the previous quarter, gross NPAs have improved. Net NPAs were at 8.9% as against 8.44% in the year-ago period. In the previous quarter, net NPAs were at 10.58%. 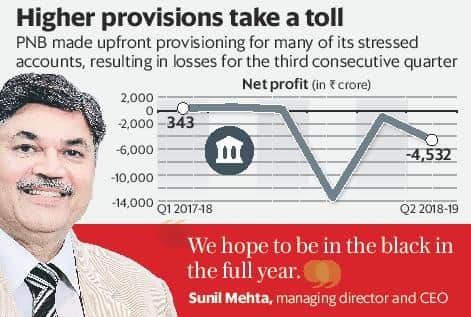 The bank made upfront provisioning for many of the stressed accounts, said managing director and chief executive officer Sunil Mehta. “We have made provisioning of more than what was required. For instance, we have to provide only 50% for cases in NCLT, but we have provided nearly 70%," he said. PNB has provided for 86% of the ₹ 14,356 crore-hit from the fraud allegedly masterminded by jewellers Nirav Modi and Mehul Choksi in January. Mehta said the bank will not seek additional capital from the government this year. PNB has received more than ₹ 8,200 crore capital infusion in the current fiscal. Its capital adequacy ratio was at 7.78% as against 8.88% in the year-ago period. Both net interest income and other income fell. While net interest income declined marginally to ₹ 3,974 crore, other income declined by 10% to ₹ 1,710 crore. Net interest margin, a key measure of profitability, fell to 2.46 from 2.64 in the year-ago period. PNB shares fell 7% to ₹ 69.05 on a day when the benchmark Sensex rose 1.68%.